Russian Plastic Tlingit Warrior Models. And more! Model of a Tlingit warrior. Source: http://www.modelsculpt.org, click for original page. Well, there’s another headline I never thought I’d write! Don’t ask me how I found it but these Russian guys have a passion for modelling human figures and one of their subjects is a Tlingit warrior. It’s actually pretty impressive, with slat armour faithfully rendered, a wooden helmet and the circular gorget or throat protector. Scroll around on that forum for more images of the model. We’ve looked at Tlingit slat armour on this site once before, as well. 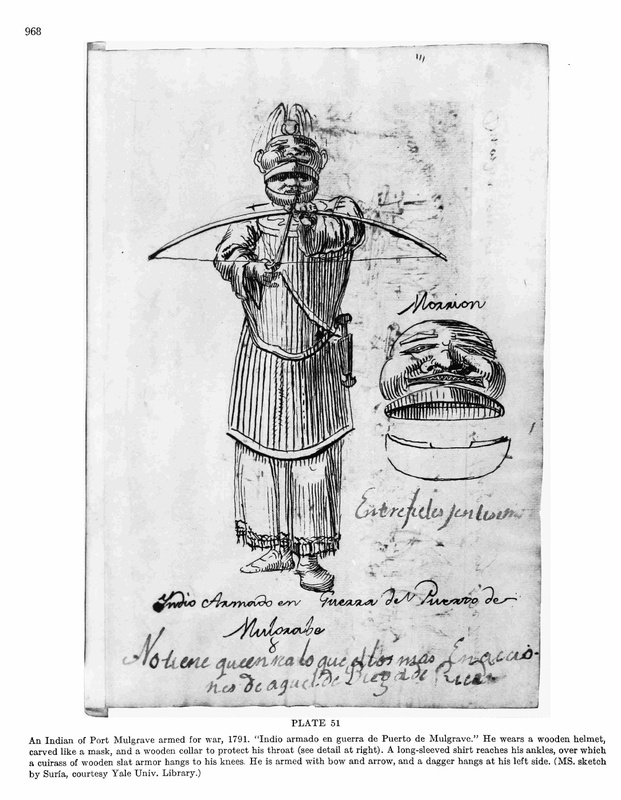 The narrow slit between the helmet and the gorget or collar might seem exaggerated, but it agrees with this picture (also perhaps exaggerated) and this drawing, both apparently from Russian sources. But there was an ancillary benefit to looking through this Russian-language forum: one of the participants has scanned some amazing pages of Tlingit art and artifacts from a Russian book, stuff I had never seen before that perhaps has its origins in colonial Russian Alaska. Tlingit slat armour. Text seems to indicate it was collected in 1804. Source: Streamphoto.ru. On the forum pages you can see a number of these illustrations ( a lot of the Russian text seems to be complaining about how hard it is to upload pictures – thanks babelfish) – or you can go to user “Sergey’s” photo pages here – click on the numbers down the left hand side to scroll through about 30 pages of this Russian language book of Tlingit items (plus some other images), and click on the little magnifying glass to the lower left of each picture for a decent resolution. At both the forum and Sergey’s picture site there are also a number of other illustrations, dioramas and so forth of traditional Tlingit life – some of these must be from Russian museums, while others are not. Anyway, it is fun to browse even if, like me, your Russian vocabulary is limited to “Vodka” and “Da, Natascha”. This entry was posted in alaska, anthropology, Archaeology, history, Northwest Coast and tagged alaska, armor, armour, Russia, southeast alaska, tlingit. Bookmark the permalink. The Tlingit armour is a fascinating subject, covered in some depth by George MacDonald of course; how far south did the rod armour extend? Lots of evidence for thick layered elk hide, glued-on pebbles, etc, further south on the coast (all the way to California? I can’t remember) and into the BC Interior. But rod armour per se is harder to get evidence for. Oh my God, I got burned, and it took me 24 hours to realize it. At least now people searching for Russian Models will have a fighting chance of getting a good date ….. with a lower standard deviation. Northwest Coast Archaeology blog: putting the DEVIANCE in standard deviation. Thanks for finding this Quentin, its got some really interesting photos in that modelling thread. This one http://radikal.ru/F/i041.radikal.ru/0902/49/60a892cb6cbe.jpg.html for example is the interior of a house, showing many interesting things. There are enormous rain hats, some very tall ringed hats (= # of potlatches given if I remember G. MacDonald again I think), a young initiate wearing a ceremonial cedar bark neck ring, what look like a blunderbuss and double-barrelled gun, a long telescope, a warrior’s helmet, a giant mask perhaps of a decapitated head, (maybe just a dozy warrior? ), and some stupendous artwork on the screen and house posts. Are the house-posts false-fronts? They don’t seem to match the size of the much smaller roof beams. Never seen these images before, nice find! Interior of Chief Klart-Reech’s House, Chilkat, Alaska. Indians in old dancing costumes. c. 1895. Description Title taken from image. Eleven men and youth on platform in the Whale House, with two bent-wood boxes, woodworm dish, rainwall screen and house posts of raven and the girl and the woodworm in background. Photographer’s number 193. I think the “woodworm dish” is the log with the face carved in the end on the topmost bench. You will find a full description starting on page 585 of Volume II of “under Mt St Elias” by Frederica de Laguna. the same character which must hinder their walking. cording to Newcombe; or probably the war pick]. arrows are the same as those of all other Indians. reaches the ankles. He wears moccasins or boots. The bevor (neck-face guard) had a toggle in it midway up that could be grasped by the teeth, to raise and lower it. Pingback: closed therad, thanks a lot garorboy.